The Clark brothers required the hall to be sited in Paisley New Town, ie on the west side of the river, “his birthplace and situation of the works of his family” (the Anchor Mills). It also stipulated that the building include a “Reading and Smoking Room from the Lower Classes”. The site selected was as close to the historic town centre as possible, just over the river from the Paisley Cross. An architectural competition was held and won by a scheme “of early French Gothic grandeur” by the Paisley architects Rennison and Scott there then followed an unexplained “period of hesitation”. The architect, W H Lynn, was a junior partner of the leading Belfast architect of the time, Sir Charles Lanyon. Lynn’s most notable surviving work is the Public Library, built in 1882, in Belfast and bears some resemblance to Paisley Town Hall. 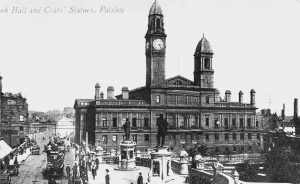 Many such poetic lines were printed in praise of Paisley Town Hall at its opening in February 1882 the Clark brothers adorned the town hall. This was resolved by the four surviving Clark brothers selecting a classical entry which had not even been short listed because it would have cost £50 000. According to the official account “the architect was summoned to an interview with the Messrs Clark; the matter of cost was not considered an obstacle”. The final cost is thought to have been about £100,000. Clark Brother’s Stewart Clark, and William Clark, now stand either side of the central entrance door. John Mossman also sculpted the bronze statue of George A Clark outside. Paisley Buddies had waited 18 years since the need for a large assembly hall had been first articulated, and nine years. The Main Hall occupies the centre of the building, from Abbey Close to the river, with smaller halls and rooms arranged to north and south, all on two stories except for the double height Minor Hall facing Gauze Street . The main hall with Corinthian columns and pilasters is clearly expressed externally by the Corinthian columned portico over the entrance, the long low pitched copper roof, and the twin towered central section of the river frontage. The rest of the elevations are treated with Ionic pilasters the (1st floor), over rusticated lower floors, with giant Ionic engaged columns denoting the Minor Hall. The five entrances from Abbey Close lead directly into the main hall across the lobby (two now obstructed by a large reception desk). It seated 2,000, of which 400 were on the gallery and 400 on the balcony at the back of the hall. Fire regulations have reduced the total capacity to 800. From the back of the balcony to the back of the stage measures 130 ft (30 ft short of the total site depth). It is 60ft wide and 57 ft high, awkwardly tall (emphasised by the height of the squat modern chandeliers). The acoustics are, however, good. A grand organ “of majestic and imposing appearance” with 234 pipes in two tiers occupied the back of the stage. It was made by Bryceson Bros and Ellis of London and was sold in the 1950’s or 60’s. the Minor Hall on the north side can be conveniently entered direct from Gauze Street it is also very awkwardly proportioned, 53ft by 30ft with a very high ceiling. The Small Hall at first floor on the south side – now part of the Alexander Wilson Suite was intended for chamber concerts and exhibitions. The upper room of the suite was the Ladies Chorus Room, enjoying until the recent conversion six southern and western windows with splendid views. Below the small hall was the Reading Room “for the Lower Classes” on the “ground basement level with a separate approach from the outside” (down the side of the building from Abbey Close). This space has been divided horizontally with the upper part now accessible from the south corridor. The town hall also had an Officer’s Residence at the North West corner with its own entrance from Gauze Street. The Exterior The colossal square Clock Tower’s 9ft inch diameter clock faces are surmounted by the octagonal belfry with 10 bells and female figures representing the four seasons by James Young of Glasgow – Autumn with a sickle-faces the Cross. the clock and bells were made by Gillett and Bland of Corydon, who also provided a Patent Carillon System, playing 36 tunes changing daily including the Marseillaise, God Save the Queen, and Scots Wha’ Ha’e. Today the repertoire comprises 12 tunes the lower tower which served as a ventilator seeks to balance the clock tower with its bulkier roof. The building’s silhouette is further articulated by eight massive chimneys (one at the North West corner now missing). The entrance elevation is balanced, deeply modelled and inviting. The entrance on the side rather than the main street the intention may have been to associate the town hall with the Abbey, whose restoration had begun in 1859. However, stylistically at odds, the two buildings look past each other, relating to each other as little as strangers passing. Later demolitions of properties backing onto the Abbey graveyard have allowed the town hall to command the view down Gauze Street to impress approaching Glaswegians. The Western Elevation The immense western elevation rises cliff-like from the river’s edge, with a restless ambiguity between the vertical emphasis of the towers and the horizontal sweep of its 15 bay 180 ft width It dominates the Dunn Square on the opposite bank, laid out 12 years later in 1894. The Gauze Street elevation’s asymmetry was probably less apparent before street widening, and the lack of focus of the southern elevation would not have been noticed before demolitions to create Abbey Close Gardens.